If you're wandering around the Regenstein Fruit & Vegetable Garden this fall, you may stumble upon Cinderella's coach. The broad Musquee de Provence pumpkins are a rich terra cotta color with deep ribs, just like the magic ride in your childhood fairy book. In France, these pumpkins are sold by the wedge, like cheese, according to Lisa Hilgenberg, the vegetable garden's horticulturist. Their flesh is thick, dense, meaty and mildly sweet, begging to be roasted. This is just one variety in the bewildering tumble of what we call pumpkins. The very name "pumpkin" comes from a Greek word meaning "melon," which was the closest Europeans could come to describing this New World plant. Like Musquee de Provence, American pie pumpkins (of which Illinois is the number one producer) are members of the species Cucurbita moschata — the same species as butternut squash. But your Jack-o'-lantern pumpkin is likely a variety of Cucurbita pepo, the same species as spaghetti squash. If you're growing for the record in a biggest pumpkin contest, you probably sowed seeds of Cucurbita maxima 'Atlantic Giant'. Things called "pumpkins" can be wide and squat or tall like pillars, small enough to fit in your palm or big enough to weigh 1,500 pounds, nearly red or sandy pale, white or gray-blue or striped with yellow. Australians don't bother with distinctions, but use the term "pumpkin" for all of the hard-shelled vegetables we group as winter squash, which includes members of half-a-dozen species. Halloween-loving Americans tend to make a clear, if unscientific, distinction: If it looks like you could carve a face in it, it's a pumpkin. Anything else is a squash. Whatever you call it, you can roast it or cook it and puree it for soup or pie, although it's hardly worth the effort with the thin-walled Jack-o'-lantern types. 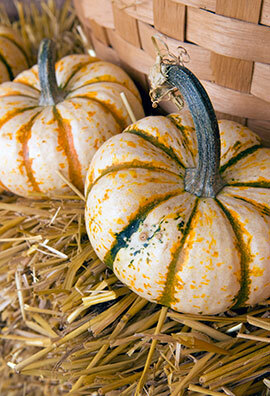 Thick-fleshed varieties often called pie pumpkins or cheese pumpkins are better for cooking. You can make pie from other kinds of winter squash, too. Squash seeds — pepitas, a Mexican staple — are delightful roasted, shelled and salted, a part of the Jack-o'-lantern ritual for many families. Any vegetable gardener with a child will be begged to grow pumpkins. It's great fun, if you have the room. Winter squash, including pumpkins, are like zucchini on steroids, with broad, garden-gobbling leaves. "Some of the vines are 16 feet," says Hilgenberg. A few cultivars of palm-sized miniature pumpkins might be supported by a trellis, but most squash and pumpkins will be too heavy for growing above the ground. So before sowing pumpkins, draw a garden plan and be realistic about how much space you can afford to set aside. If space is tight, look for dwarf or compact varieties that have shorter vines and (usually) smaller fruit. But still, don't expect to fit them into a shoebox back yard. Pumpkins and winter squash need a long growing season — about 100 to 120 warm days, depending on the variety. They don't like their roots disturbed, so it's best to sow the seeds directly in the ground. But they're also very tender and will fail or rot in cold soil. Planting too early can make the plants extra vulnerable to some insects such as squash bugs, Hilgenberg says. So wait until mid-June, when the ground has thoroughly warmed up, before you plant the seeds in soil that has been enriched with compost or well-composted manure. At the Garden, 3 inches of composted manure were dug into the pumpkin patch. Be alert for beetles, but avoid pesticides, since the pumpkins need bees for pollination. The fast-growing vines and the swelling pumpkins will need a steady supply of moisture, and Hilgenberg recommends some system for getting water underneath those umbrellalike leaves. Soaker hoses work well, but it's important to lay them out when you plant the seeds, before the pumpkin vines start snaking all over. Another old strategy that Hilgenberg recommends is to poke a pinhole in the bottom of an old bucket, coffee can, or milk jug, place it near the crown of the plant, and fill it with water that will soak in slowly. More frequent watering will be needed as the summer heats up, the vines and leaves grow, and the pumpkins develop. Many gardeners pinch off branch stems to concentrate the plant's resources into a few chosen pumpkins. Champion pumpkin growers take this to an extreme, usually keeping only one pumpkin per vine and lavishing it with fertilizer and water to push it to grow as big as possible. Gardeners who are not shooting for 1,500 pounds can afford to keep several pumpkins and should be able to depend on the nutrients in well-enriched soil. Pumpkins often grow flat on the side that lies on the ground. For the best shape, lift the pumpkin onto a cushion of straw while it's still young and light. The cushion will minimize flattening but also keep the pumpkin from sitting on wet soil and rotting. It is ripe when it is a deep, rich color (whatever color that variety is intended to be) and the rind is hard. Cut the prickly stem with a sharp knife so a protective stub remains on the pumpkin for better keeping. Store pumpkins in a cool, dry place until it's time to carve with a face, roast, bake into a pie, or hollow out for a Thanksgiving centerpiece. Saving seeds is easy but it can be tricky, because pumpkins easily cross-pollinate with other members of the same species, producing a next generation with different characteristics. And since what we call "pumpkins" may belong to several different species of squash, your pumpkins might be cross-pollinated by your butternut squash or your zucchini (or your neighbor's). Buying new seeds each season is the best way to make sure you get what you expect. Pumpkins come in all sizes, shapes, and textures. Visit the Garden this fall and see if you can find some of these interesting varieties in the Fruit & Vegetable Garden. Click on the images above for a larger view of pumpkin cultivars from around the world, including Jarrahdale, Kakai, Lakota, Marina de Chiaggia, Orange Daum, Seminole, Veracruz Pepita, and Triamble.